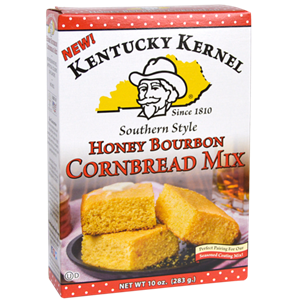 A unique twist on this traditional side dish pairs Kentucky Kernel's own premium yellow cornbread recipe with the distinct southern flavors of sweet golden honey and a pleasing hint of rich vanilla and smoky bourbon. Unlike most store mixes, the first ingredient is premium-quality corn meal. Baking up hot, springy and melt-in-your-mouth delicious, the unexpected yet scrumptious honey-bourbon flavor makes this cornbread a unique and decadent treat your family will love! "DEGERMINATED YELLOW CORN MEAL, SUGAR, UNBLEACHED UNENRICHED WHEAT FLOUR, BLEACHED AND ENRICHED WHEAT FLOUR (CONTAINING NIACIN, REDUCED IRON, THIAMIN MONONITRATE, RIBOFLAVIN, FOLIC ACID), POWDERED SHORTENING (SOYBEAN OIL, CORN SYRUP SOLIDS, SODIUM CASEINATE, MONO-& DIGLYCERIDES), HONEY BOURBON BUTTER FLAVOR [FRUCTOSE, HONEY TYPE FLAVOR (CORN SYRUP SOLIDS, MODIFIED FOOD STARCH, NATURAL FLAVOR), BOURBON TYPE FLAVOR (GUM ARABIC, NATURAL FLAVOR), NATURAL BUTTER FLAVOR (MALTODEXTRIN, MODIFIED BUTTER OIL, SALT, DEHYDRATED BUTTER, GUAR GUM, BAKING SODA, AND ANNATTO AND TURMERIC (FOR COLOR)), GRAHAM CRACKER FLAVOR (MODIFIED FOOD STARCH, SORBITOL, NATURAL FLAVOR)], SALT, LEAVENING (SAPP, BAKING SODA, MONOCALCIUM PHOSPHATE). ","DEGERMINATED YELLOW CORN MEAL, SUGAR, UNBLEACHED UNENRICHED WHEAT FLOUR, BLEACHED AND ENRICHED WHEAT FLOUR (CONTAINING NIACIN, REDUCED IRON, , THIAMIN MONONITRATE, RIBOFLAVIN, FOLIC ACID), POWDERED SHORTENING (SOYBEAN OIL, CORN SYRUP SOLIDS, SODIUM CASEINATE, MONO— & DIGLYCERIDES), HONEY BOURBON BUTTER FLAVOR FRUCTOSE, HONEY TYPE FLAVOR (CORN SYRUP OLIDS, MODIFED FOOD STARCH, NATURAL FLAVOR), BOURBON TYPE FLAVOR (GUM ARABIC, NATURAL FLAVOR), NATURAL BUTTER FLAVOR (MALTODEXTRIN, MODIFED BUTTER OIL, SALT, DEHYDRATED BUTTER, GUAR GUM, BAKING SODA, AND ANNATTO AND TURMERIC (FOR COLOR)), GRAHAM CRACKER FLAVOR MODIFED FOOD STARCH, SORBITOL, NATURAL FLAVOR)], SALT, LEAVENING (SAPP, BAKING SODA, MONOCALCIUM PHOSPHATE)."